Update: The stream is over, head over to our Twitch channel to watch the VOD. 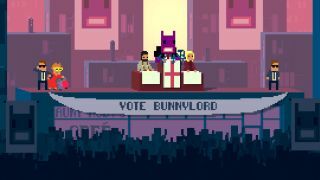 Original: Not A Hero is a 2D, side-scrolling shooter from the makers of OlliOlli, though it's self-described as "2¼D" to be more accurate. I'm not entirely sure what that means but I'm looking forward to finding out, and you can find out with me in our livestream today. This'll be my first look at Not A Hero, which won't be released until May 7th. We'll be livestreaming Not a Hero from our Twitch channel today from 3-5pm PDT, come watch!